After this weekend, I seriously can't believe that I grew up in the Northeast and had never been to the Catskills! On Friday after work I packed up my stuff and Pat and I headed off to the Catskills for the weekend. After being at the beach so much this summer, it was nice going somewhere completely new and different. 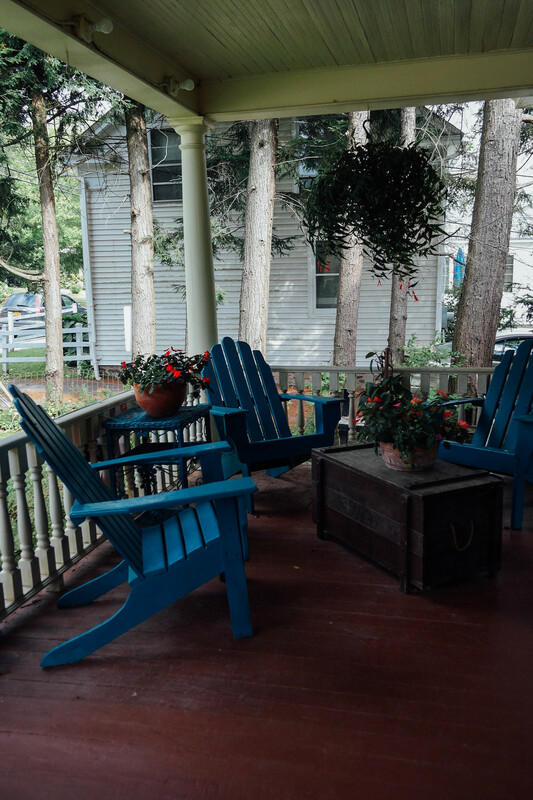 We stayed in Fleischmanns, New York, a super tiny town way up in the mountains, at the River Run Bed & Breakfast. It was so charming and welcoming and Ben (who runs the B&B) is a great chef. I had baked French toast for the first time and now am determined to make it myself. On Saturday, we drove about 45 minutes to Kaaterskill Falls, the tallest waterfall in NY (yes, apparently it's taller than Niagara Falls!). We hiked up to the bottom of the waterfall and hung around for a bit, enjoying the view and the light mist. Apparently at one point you could hike up to the very top of the waterfall, but the trail is closed right now because they're doing construction to make it safer. A few people died hiking it last year (scary!). I definitely want to go back when the top path is re-opened. Another major highlight of the day was eating a late lunch at the Phoenicia Diner. I loved the bustling atmosphere and could tell by the fact that we had to wait 30 minutes that it was going to be good. We weren't disappointed! Pat and I decided to be twins for the day and each got tortilla soup with a cubano sandwich (we were feeling inspired after watching Chef last weekend). DELICIOUS! Sunday we drove out of the Catskills and down to Sam's Point Reserve to do a 5 mile hike to Verkeerderkill falls. The terrain at the top of the mountain seemed almost beachy, with a lot of sand and short bushes. I felt like I was stumbling over rocks the entire way there and Pat was complaining how it was taking longer than it should have :-/. Seeing the waterfall at the end was worth it though (even though we couldn't figure out how to get to the bottom and it was sort of a trickle due to the dry summer) and I nearly had a heart attack when Pat decided to walk right over to the edge of the falls and sit down. I can't wait to get back to the Catskills and already want to plan another trip! Anyone who has good recommendations, please let me know.